Balimund is a Nord and the local blacksmith of Riften as well as an expert-level trainer in Smithing. He wears a blacksmith's apron and a pair of shoes. He is equipped with a leveled dagger which can be up to ebony quality, and carries a key to his store, as well as a selection of common loot and gold. He is somewhat arrogant, and will often say "Come to see Balimund perform miracles with steel, eh?" Some of the locals have accused him of making money from the civil war and if asked about this fact he will respond with "People say I'm making gold off of other people's misery, but what else would I do? Smithing is all I know. Next time one of my shields deflects a killing blow, they'll change their tune." Balimund claims his forge is so strong because it is the only one that feeds on the rare ingredient, fire salts. When you comment, "You seem quite proud of your work. ", he will remark that "The secret is my forge. It consumes fire salts, a strange mineral that burns as hot as Red Mountain lava." Unfortunately, he has run out and is in need of some more. Although it has no effect on the quality of items he offers for sale, helping him grants a boost to his friendship, allowing you to take certain items from his home. He also becomes a potential candidate for marriage. He will start his day at 6am and proceed to have breakfast for one hour, and then will spend the morning smithing outdoors. He will have lunch inside The Scorched Hammer at noon for one hour, spend the afternoon outside smithing until 6pm, then go back inside to have dinner for one hour. 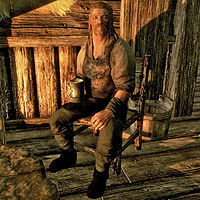 He will then spend the rest of his evening outside smithing until midnight, when he will retire inside and sleep. If Balimund dies, Asbjorn Fire-Tamer will take over his store. Esta página foi modificada pela última vez à(s) 22h51min de 31 de julho de 2013.